New tour dates from Subhadramati and your chance to win a signed copy of Not About Being Good! To celebrate the launch, we are giving away a signed copy of Not About Being Good! To be in with a chance of winning the book, just tell us why Buddhist ethics inspire you – complete the sentence ‘I love Buddhist ethics because…’, email Hannah at hannah.atkinson@windhorsepublications.com or post on our social media sites (Facebook, Twitter, Tumblr, LinkedIn and thebuddhistcentre.com) and our favourite answer will win the signed book! 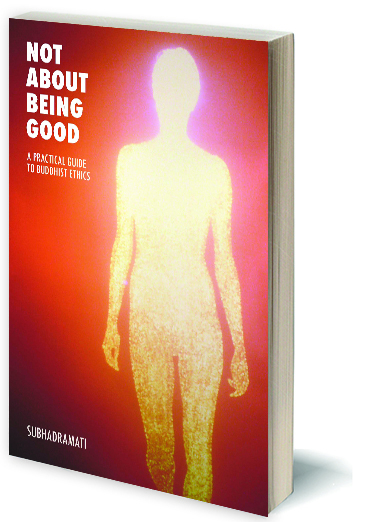 You can watch the Not About Being Good launch event hosted by Maitreyabandhu and Subhadramati at the London Buddhist Centre for inspiration. Good luck!